Former Solicitor General, Gopal Subramanium was also in the pipeline to be appointed as Supreme Court judge but that proposal was taken down by the NDA led Narendra Modi government. But there is still hope for Subramanium to still be appointed if the collegium reiterates the recommendation of Subramanium, the government is bound to accept his elevation. Official sources said Subramanium's case was turned down by the Law Ministry after examining reports it had sought from the CBI and the Intelligence Bureau on him. Rohinton Nariman was a former Solicitor General and was one of the youngest lawyers to be designated as Senior Counsel by Justice Venkatachaliah (the then Chief Justice of India) in 1993 at the early age of 37. 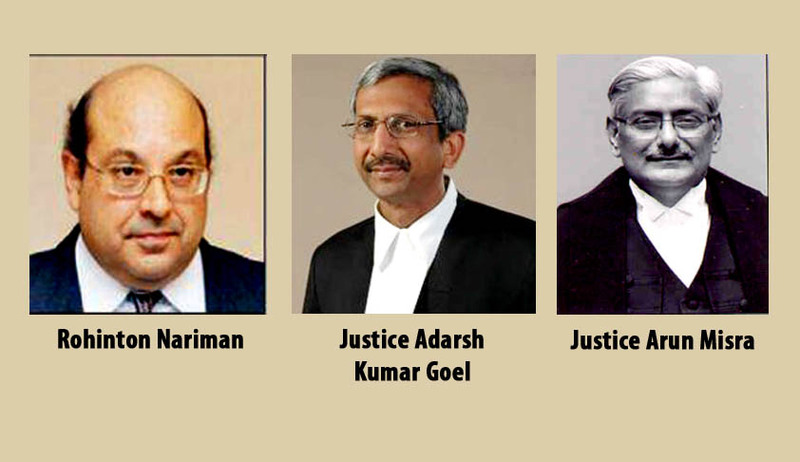 Nariman is the son of eminent jurist Fali S Nariman. Justice Goel, 61, was designated senior advocate by the SC in 1999 and two years later was appointed as a judge of Punjab and Haryana High Court. He was appointed chief justice of Gauhati High Court on December 20, 2011 and was transferred to Orissa High Court as CJ on October 12 last year. Justice Misra, 59, was part of law faculty in Jiwaji University, Gwalior from 1986 to 1996. He was appointed as additional judge in Madhya Pradesh High Court on October 25, 1999 and was made a permanent judge on October 24, 2001. He was appointed chief justice of Rajasthan High Court on November 26, 2010 and was transferred to the Calcutta HC as CJ on December 14, 2012.